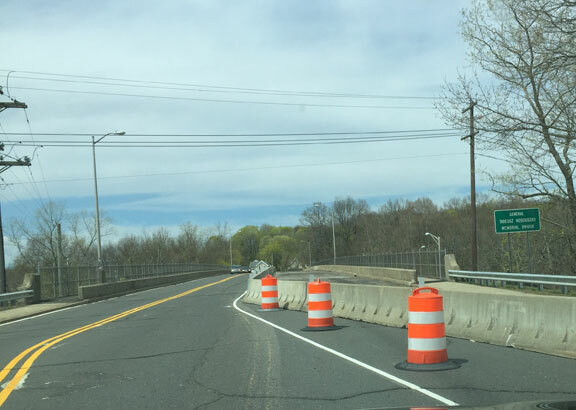 NAUGATUCK — A bridge rehabilitation project on Route 68 that began this month is expected to last until November 2018. The $12.8 million state Department of Transportation project includes replacing the existing concrete bridge beams with high-strength weathering steel, full replacement of the existing concrete deck, reconstruction of the bridge set at both abutments, reconstruction of existing wing walls and various repairs to the existing five piers. Extensive utility relocation is also included in the plans, according to DOT. The project is being completed by Mohawk Northeast, Inc., the same company that is expected to work on the rehabilitation of the Whittemore Memorial Bridge on Maple Street downtown, Department of Public Works Director Jim Stewart said. The Route 68 bridge, which is named the General Tadeusz Kosciuszko Memorial Bridge for the Polish military hero who fought with the Americans during the Revolutionary War, connects Bridge Street to Prospect Street. It runs over Route 8, Metro-North Railroad and the Naugatuck River. Traffic is expected to be impacted during certain construction times. The DOT says Route 68 could see lane closures Mondays through Fridays between 9 a.m. and noon, on Saturdays between 10 a.m. and 6 p.m. and Sundays before 11:30 p.m.
Route 8 under the bridge could see road closures between 9 a.m. and 3 p.m. Monday through Friday and before 1 p.m. on Saturday and Sunday. All other roadways in the area could see lane closures between 9 a.m. and 3 p.m. Monday through Friday and before 10 a.m. on Saturday and Sunday. Traffic has already been impacted as cars have been backed up on both Bridge Street and Prospect Street at certain times during the first two weeks of construction. The DOT states the project is necessary due to the bridge’s “deficient superstructure,” primarily due to the condition of the pre-stressed concrete girders. A superstructure is a structure built on top of something else. “The expansion bearings are frozen in the contracted position, the pre-stressed concrete beams exhibit cracks at the end of the beams and there are spalls (breaks) and exposed strands on the underside of some of the beams at midspan,” DOT states in a news release. The overall width of the replacement structure will match that of the existing structure. The abutment and pier concrete pedestals will be modified to accommodate the proposed steel girders, according to the DOT news release.